As general manager for KZAZ-TV Channel 11 in Tucson, Gene brought the University of Arizona Basketball games to television stationg in 1972. Later, the staion also aired games for UA football, high school sports, an Tucson Toros baseball. But it all began with Wildcats basketball. Gene took the idea to then coach Fred Snowden, and the first game on TV was aired Decmber 28, 1972, a road game at UNLV which the Cats lost 65-64. Gene did the play-by-play announcing himself. Gene also served on the Tucson Convention Center board of directors, which brought in pro basketball and hockey games and boxing matches. As a member of the Tucson Baseball Commission in 1967, Gene also helped bring Class AAA baseball to Tucson in the form of the Tucson Toros. The team started play in 1969 as the top farm team of the Chicago White Sox. As news director for KOLD-TV Channel 13, Gene developed the first local newscast at 10 p.m., which included locals sports coverage. 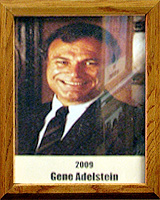 Gene passed away in 1986.